I made plans to meet up with a couple friends before I went away on my workaction. Of course, a couple of them bailed, lame, I know. But, as expected, I had a great time with the ones that made it out. 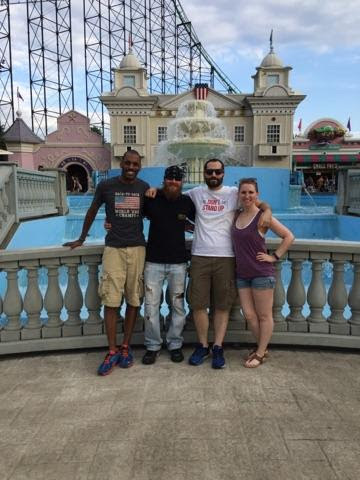 We all decided to go out to an amusement park. Asper texted me and said that he and his wife would be getting to the park late because he would have to wait for her to get off of work, probably around 2:30. I misread this as she wasn’t getting off of work until 2:30. What he actually meant was that they would get to the park at that time, so I was an hour an a half late… I really hate being late. My buddy Flee Daddy made it out. He was supposed to arrive at around about the same time that I did. He was also an hour late. 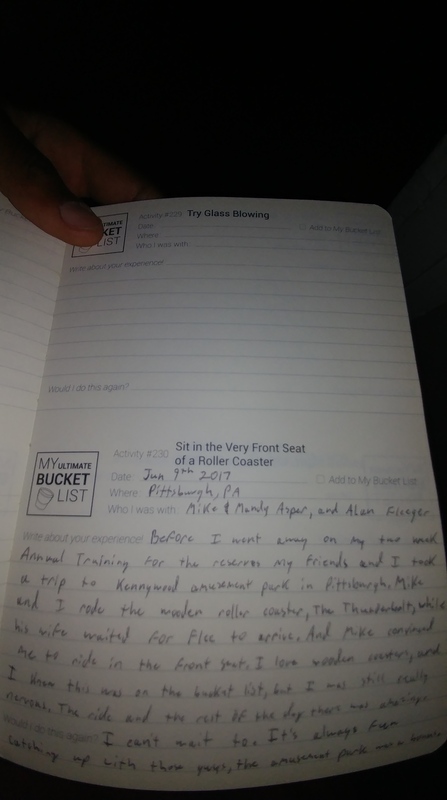 While we were waiting for him we decided to go on a roller coaster, where I got talked in to riding in the front seat. I love wooden roller coasters. The creeks that it makes as you go around adds to the fear which only makes for a better ride in my opinion. Luckily this was a short ride. Of course, Flee arrived at the park as we were in line for the death machine, and refused to hurry up in order to meet us in line. Still in line, Flee calls me and says that he it at the ride but can’t see us. He said that he was standing by a fence. So now the three of us are scanning the fence and waving at the crowd only to find that he was actually at the wrong ride. Asper’s wife Manders waited for him while Asper and I rode that coaster. It started with an immediate downhill then a sharp right turn and up to the conveyor belt. I LOVE wooden coasters and this one (although short) did not disappoint. I’m so glad that I got to share this experience with my buddy. Afterwards we all met up and proceeded to ride the rest of the coasters in the park. I turned into a scared little kid on each and every one. Talking nonstop to mask/ease my nervousness. Hopefully next time we can get a bigger group together, and have them all ride it with us. Until next time, save the link to my page, come back soon. P.S. 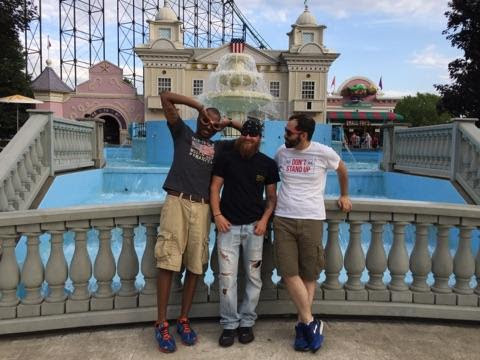 This is Asper, Flee, and I at the fountain in the amusement park, Asper’s wife was nice enough to take this picture for us. As we were taking pictures I noticed that I had apparently missed the memo to bring sunglasses. So, I improvised, adapted, and made my own. Oh, no need to apologize, the longer the better haha. This was the first roller coaster I’ve been on in YEARS, I liked it, but I think my rip cord pulling days are behind me too haha. As for Facebook, I rarely ever use it. I only really go on to check my memories, and I MIGHT leave a comment or like every once in a while. I probably won’t get more active on it than I am now, but I think once every month or so I’ll post one of my blogs there and see what kind of traffic/response that brings. Hmm… Maybe I’ll look for a blog group on there.